My parents had 5 boys in 4 years, two sets of twins only 18 months apart. We did things that would get our parents put in prison today. We played with knives, whittled sticks, set fires, etc. That is a long list of etceteras, I’m not sure on the statutes of limitations so we will keep it at that. Guess what though? All five of us made it to adulthood. These things made us the men we are today. I am a web developer. I have a brother that is a marketing consultant, two network engineers, and a process control engineer. These are the activities that taught us problem solving. We gained confidence by being in difficult situations. We learned to assess and mitigate risk. I’m not saying toss a box of knives, matches, and some gun powder in the middle of the floor and head out for the evening. What I am saying is to create a safe environment, a lab of sorts, where they can learn and experiment and grow. Supervision and education will go a long way to keep them safe. 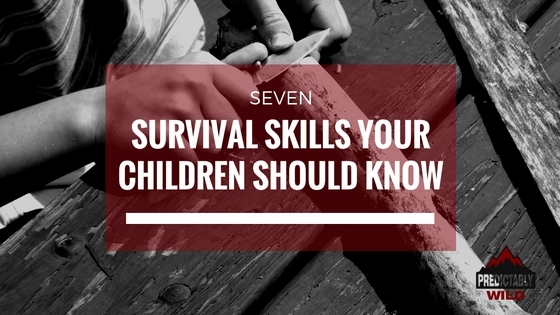 Here are a few of the survival skills that I see as essential for kids. Hold on a second, teach your kids to play with fire? Yes! Let them learn to control the element that separates man from the beasts. Teach them to build a fire. Let them learn about the principles of combustion (ie light fires, squirt lighter fluid on them, put them out). They should learn to use fire for tools and to cook with. There are going to be burns, smoke in the eyes, and some singed hair. It will be so much fun. Teach them to respect fire how to be safe around it. Fire can destroy and they need to be comfortable around it. Staying hydrated is essential for life. You can survive for weeks without food, but only a few days without water. The unfortunate part is most of our water is contaminated and needs to be purified before you can drink it. Show them the best places to find water and then how to purify it. I think boiling is best. Have them make a fire and try boiling water in different containers. Building forts is fun, but it’s even better in the wild. Your kids will have a ton of fun sleeping in a shelter that they helped make. In a survival situation shelter should be your first priority. Shelter means safety. Shelter building teaches problem solving. To build a shelter they have to look around them and use the materials on hand. There are few greater skills in life than being resourceful. Turn your kid into a problem solver. Tying down a load or building a tarp structure are useful skills. Many of the boys I teach can tie basic knot but don’t know which knot works best in each situation. Teach them a few basic knots and when to use them. This makes a fun evening activity at home or around the campfire. Later on in life these rope skills will make them handy. But but but knives are dangerous right? Absolutely. They are not toys and should never be used without adult permission and supervision. A great place to start is in the kitchen. Kids love helping and this is a safe start. Have them cut your vegetables for dinner. Teach them proper technique and to respect the blade. A dull knife is more dangerous than a sharp knife so they should learn to sharpen them. Getting some confidence in with a knife in a safe environment can get them ready for use in the wild. First aid is a good thing to learn when you let kids play with knives. Just kidding (sort of). The first thing they need to learn is how to call for help and how to describe the situation. Knowing how to accurately describe the situation to first responders can save lives. Staying calm can is learned by role playing different scenarios. In an emergency make sure they know your home address and who to call. This is a great way to prepare your family for disasters without scaring them. You don’t need to tell them every scary thing that might happen, prepare them to think on their own. The most important way to stay safe is to learn to avoid dangerous situations. Don’t make the mistake of overlooking this part of survival. A basic definition of situational awareness is knowing what is going on around you. To be safe in any environment your kids need to know three things; who, what, and where. The easiest way is to make it a game. When you are at a restaurant quiz them. Ask them questions. What is the name of the restaurant [WHAT]? How did we get there [WHERE]? How many people are wearing hats [WHO]? How many exits are there [WHERE]? When you leave the restaurant let your kids lead you back to where you parked. This is a blast for them. Ask them about birthday parties or friends’ houses that they go to. How many people were there? How many people did they know and how many they didn’t know? How many of them were women? Getting them to actually observe their situation is more than half the battle. Give your kids the best gift you could ever give them; self-confidence. You don’t learn confidence by having mommy and daddy protecting you from the world.